Background: The human scalp has various functions from protecting the skull bone to providing an aesthetic look. Various condition of the scalp that can cause full or partial thickness scalp loss are trauma (gunshot, RTA, avulsion injuries), acute and post burn injuries, post tumour excision defects and scalp infection etc.Subjects and Methods:This retrospective observational study was conducted over a period of 3 years in a tertiary care centre and the different etiologies of scalp injuries along with the various techniques of scalp reconstruction were discussed.Results:A total of 50 patients of both sexes and any age with full or partial thickness scalp defects were admitted. The most common age of presentation was 20-40 years age (40%) with trauma (56%) being the most common etiology followed by burns in 30% patients. 40 % of the patients were reconstructed with skin grafts while in 30% patients local flaps and in 10% patients tissue expanders were used.Conclusion: An aesthetically pleasing scalp reconstruction requires a precise preoperative planning with detailed knowledge of scalp anatomy and blood supply. The wide armamentarium of techniques for reconstruction allows the plastic surgeon to give a much pleasing final result. Assistant Professor, General Surgery, Srinivas Institute of Medical Sciences and Research centre Mangalore. Published by: Dr Sanket Hiware, College of Medicine and Health Science, DireDawa University, Ethiopia. 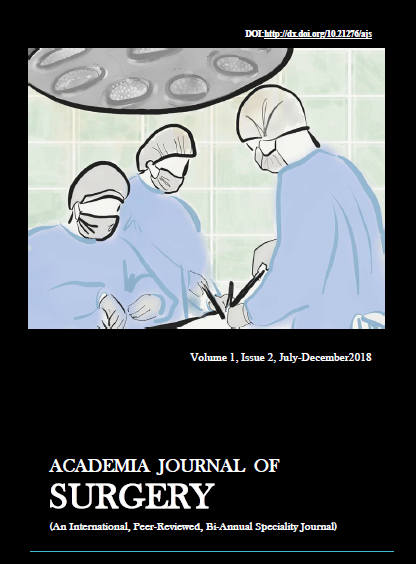 Academia Journal of Surgery by AJS is licensed under a Creative Commons Attribution-NonCommercial 4.0 International License. Based on a work at http://aijournals.com/index.php/ajs. Permissions beyond the scope of this license may be available at http://aijournals.com/index.php/ajs.